Grading is one of the most difficult issues to teachers, you have to be aware of everything may affect the result of student`s grading, details must be taken into account. This paper will shows some suggestions for a better grading and some aspects that you must take into account at the time of grading. It is said that grades reflect personal philosophy and human psychology, as well as efforts to measure intellectual progress with objective criteria. For students, grades are the most frustrating thing and their importance means that all the time the teacher has to be in constant effort to be consistent, fair and reasonable and to maintain grading standards you can defend if challenged. In the grading process what is learned is quantified and feedback is given on how much the students learned. In my case when grading time comes I feel very overwhelmed and nervous because I know it is going to be a hard job, but now as I have been reading interesting and helpful articles about grading besides the presentations of my partners have shown a wide perspective about grading, so that I can share interesting issues concern grading. Before grading you have to take into account important aspects such as how much responsibility you have assigning particular or overall grades maybe for most teachers it is like a sign of power but it is not, rather it is a large responsibility. The evaluation criteria has to be given to students in order for them know what are the course requirements and the rules to follow. Following the guidelines you established in your syllabus is very important, the teacher has to be consistent and respect his/her syllabus. Students should know how are going to be graded, in case that they would have questions or doubts, the teacher`s duty is to clarify them. If students don`t agree, you have to rational with them in order to find the solution. Besides they have to know how attendance, tasks, participation etc will affect their grades. It is good for students to have multiple choices to show their learning process, a few short tests show better information than a long one. Feedback in a very important element in students’ development, corrective and formative feedback will help them to improve. Grades are very important for students and the teacher must be fair. I was not aware of how grades may affect students’ confidence and I tell them their grades in public but I noticed that some of my students felt bad when I mentioned their grade so I decided to be more careful a bout that, all students have the right of privacy. In all the assignments set your expectations. And make sure to explain clearly what you expect from the students. They have to know your grading rubric you will use and all the things you would like them to do before giving the assignment. In the grading process get an overall sense of how students did on average. The teacher has to be consistent and fair with all graders, so that the criteria set has to be followed. Another important think to take into account when checking long writing tasks is to not to be tired or bored, maybe it sounds like ridiculous but it is true, it happens to me when it is time to check a large amount of exams it starts well, but when I have revised many of them I feel tired and bored and it makes that I do not make well my job, and it leads to commit mistakes. And when I have done all the grading go back to the first several papers to make sure you were fair. What I usually do is to give the exams back to my students in a timely manner so that students can correct their misconceptions, or use the feedback in their further learning. Besides I give them a limited time for example a day to review their exam, to request a grade adjustment, and justify their request. Comments are important to be accompanied whit the grade, but not only guided feedback or comments about mistakes, positive feedback, no matter how bad the paper is, it could be a good way to increase motivation. What I have noticed is that my students feel more confident when I write good comments in their papers. Also students may be involved in the grading process to help you transform comments into teachable moments. And each comment can be as a guide to personalize your grading. Avoid writing bad comments which can make feel students frustration, rather you should invite students to talk to you outside the classroom to encourage them to improve their performance and provide guidance on the tasks content. Order is the key point to maximize your time; students have to be asked to give their work in order to save you some time putting every thing in order. Every time I ask students to give me papers a revise them at home, once I have done it, for the next class I give them back to my students, and I try to not accept papers overtime, because it may leads me to spend more time trying to organize those missing papers. I do not correct every grammatical error. Rather, edit one or two sentences and highlight the type or error made and instruct the student to revise the paper. Sometimes I ask students to exchange their papers so that they correct each other`s. This is a good way to involved students in the grading process. The school I work at, I asked to take into account other aspects such as attendance, participation and behavior. Since I grade attendance, I make sure that my class time is meaningfully used, or students will be resentful. Most of the times students misunderstand this concepts, for example when I grade participation students think that by doing the task they are getting the participation but they do not take into account how well or bad they are in it. They often relate how long and hard they worked at something that only demonstrates a modest understanding. 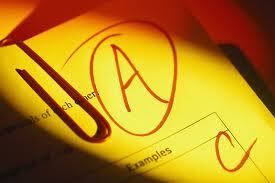 Student effort must be recognized but should not be a consideration in assigning a grade. Statements such as – “I can see how much effort you put into this to attempt to understand it. I am happy to be able to give you a (x) on the skills you have demonstrated. Keep up the good work” (Ory, J. C., & Ryan, K. E. 1993). It might help students understand that you recognize the subject is difficult for them, but because of their effort, they are performing at a good level. So teachers have to be very careful when grading these considerations because students are specialists to complaint about the results of their performance even when they know that they do not do a good work. According what I have learned I my class of evaluation, I think that there is no perfect test. According to Angelo, T.A any assessment will have errors in it because of insufficient sampling, ambiguity, misconceptions, fatigue, multiple interpretations, new knowledge, etc. With this in mind, remember that a test score is an approximation of actual performance or skill. Instructors must be flexible about grading (1993). Well as you know, grading is a difficult and hard task but can use some techniques which can make our job easier and I hope this paper may help my colleagues who are new in this hard field that is being an English teacher. I THINK WE HAVE TO PAY ATTENTION ON HOW WE GRATE OUR STUDENTS, WE ALSO NEED TO PAY ATTENTION TO THE DIFFERENT STRATEGIES WE USE TO TEST OUR STUDENTS. Well Viri, we are here in this career to learn a lot of new things, one of them is to learn how to grade our students. There are many factors that we need to put into consideration, like participation, homework, exams, and many other, but the students need to be aware how are we going to grade them, and this has to be done since the first day of class. we, as teachers, need to have ethic at the time of the evaluation and grade every single student the same way with no preferences or maybe because we say, he is my nephew or my niece, lets act like professionals. What an interesting video about the percentages: I FINALLY UNDERTOOD WHAT THE LETTER GRADE REALLY MEANS, BUT MOST IMPORTANTLY, I FINALLY UNDERSTOOD WHAT THE BELL CURVE IS AND HOW IT WORKS…thanks a lot!! !